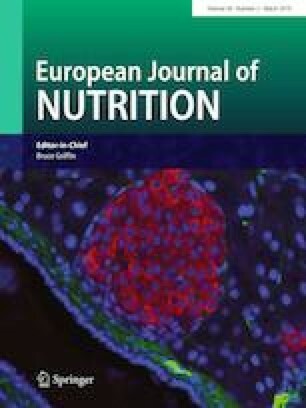 To examine whether supplementation with low doses of fish or milk proteins would affect glucose regulation and circulating lipid concentrations in overweight healthy adults. Ninety-three overweight adults were assigned to receive 2.5 g protein/day from herring (HER), salmon (SAL), cod (COD) or milk (CAS, a casein–whey mixture as positive control) as tablets for 8 weeks. Seventy-seven participants were included in the analyses. HER and SAL did not affect glucose and insulin concentrations. COD significantly reduced within-group changes in 90 and 120 min postprandial glucose concentrations but changes were not different from HER and SAL groups. CAS supplementation significantly reduced the area under the curve for glucose concentrations (− 7%), especially when compared to SAL group, and reduced postprandial insulin c-peptide concentration (− 23%). Reductions in acetoacetate (− 24%) and β-hydroxybutyrate (− 29%) serum concentrations in HER group were more prominent compared to SAL and COD groups, with no differences between fish protein groups for α-hydroxybutyrate. Serum concentrations of α-hydroxybutyrate (− 23%), acetoacetate (− 39%) and β-hydroxybutyrate (− 40%) were significantly reduced within CAS group, and the decreases were significantly more pronounced when compared to SAL group. Serum lipid concentrations were not altered in any of the intervention groups. Findings indicate that 2.5 g/day of proteins from fish or milk may be sufficient to improve glucose regulation in overweight adults. The effects were most pronounced after supplementation with proteins from cod, herring and milk, whereas salmon protein did not affect any of the measurements related to glucose regulation. This trial was registered at clinicaltrials.gov as NCT01641055. Ida Heir Hovland, Ingrid Sande Leikanger, Oddbjørg Stokkeland and Kaia Hevrøy Waage contributed equally to this work. GM, TR, IH and OAG formulated the research question and designed the study. RS, AC, TR and IH prepared the fish protein hydrolysates for the study. IHH, ISL, OS, KHW and OAG conducted the clinical study. SAM, KAB, AM, PMU and OAG analysed the data and performed statistical analyses. OAG drafted the paper and had primary responsibility for the final content. All authors have contributed to the writing and approved the final manuscript. We thank all participants who have contributed to the current study. The present research has been supported by funding from the Bergen Medical Research Foundation and the Regional research fund of Western Norway (Project No. 212625). These sponsors were not involved in the design of the study, data collection, analysis and interpretation of data, writing of the article or in the decision to submit the article for publication. TR was during the time this study was planned and conducted employed at Nutrimar AS, a company owned by the investment company Kverva AS who also own SalMar ASA. SalMar ASA is one of the world’s largest producers of farmed salmon, and provided fresh salmon backbones for this study. IH is CEO and Chairman of Blue Protein, a company that commercialises new products based on fish proteins from fish by-products. Nutrimar AS, Kverva AS, SalMar ASA and Blue Protein were not involved in on-site data collection. The other authors declare no conflicts of interest.